Q1.) 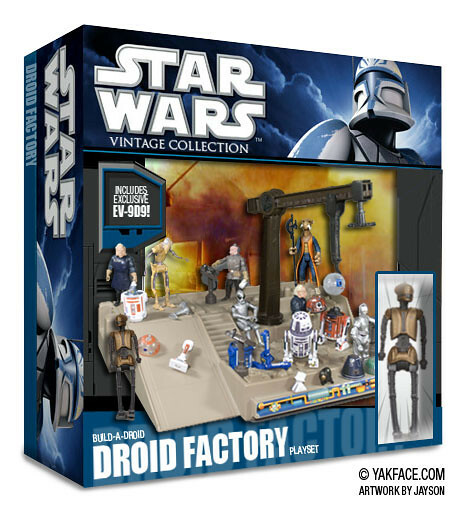 I know you have decided against a "Droid Factory" type playset due to costs, but what about releasing sets of BADs using battlepack or 2-pack type packaging? There would be no new tooling costs, and you could package the droids in an "exploded" format to play up the interchangeability of the parts. You could even reuse the packaging design by releasing "refreshes" of the same droids but in different paint schemes. This is an idea we have been looking at, but have not yet slotted something like this into the lineup. Their second question mentions Hasbro are trying to find a way to release a BAD R2 D2 and C3 PO. Really back in the day Hasbro used to say the molds (both design and sculpting) were the most expensive parts of the process, they have more than made the money back on that part of it so really they would only be paying for paint now. Yeah, would seem very logical to bring back these molds and use them over and over moving forward. They can switch things up a lot with these with different paint schemes. And I really hope they find a way to fit in 3PO and R2 into this format somehow. dozen BAD droids there actually wasn't me. I'll be looking for whatever they do with the build-a-droids. I was thinking about the abandoned concept of a Droid Factory Playset meant to add additional play value to the now expired Build-A-Droid feature from the Legacy Collection and came up with the above mockup. Is this something you wish Hasbro would have attempted or does the idea of recycling a 30 year old mold smack of desperation? I'd buy that in a heartbeat. I know Hasbro is afraid of playsets, but this one has a lot of potential. Kids and their parents and collectors as well could spend hours playing with something like this. Also, imho Hasbro focuses way too much on the aggressive side of Star Wars in my opinion, especially for kids. I'm not talking about all figures having blasters, but the fact that they say they won't make something because it's not aggressive enough. Not everything in SW was/has to be aggressive. This playset would be a step in the direction of creating something rather then destroying something. That playset makes sence, I would grab it as well. For a second there i nearly fell for it and thought it was real! 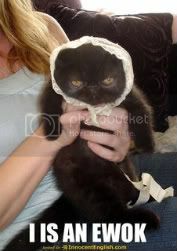 Paulskywalker wrote: For a second there i nearly feel for it and thought it was real! I did the same thing and got all excited for nothing. Heck yeah I would love something like this as long as it was packed with at least 4 different droids. Ugnaughts in Jabba's Palace, eh? Heh heh, I actually like the idea quite a bit. Anyways, YES - I'd be interested in something like this for sure. If it came with a new EV-9D9 and also new 8D8 or whatever his name is, along with some junk droid parts and had a cool new paint job on the old mold, that would be great. However, I would personally prefer something that looked more like it was from the movie itself. More of a diorama feel to it, with the torture rack pulling apart Jabba's old protocol droid... that would rock. And with it, include B.A.D. versions of C-3PO and R2-D2 - who wouldn't be interested in that? Thanks. Good point about the Ugnaughts being in Jabba's Palace. I changed the name of the set to be Build-A-Droid Droid Factory Playset. Jayson... buddy you really should do some more mockups like this... perhaps with some of Owen's work (I could send you some pics loaded with new figures...).